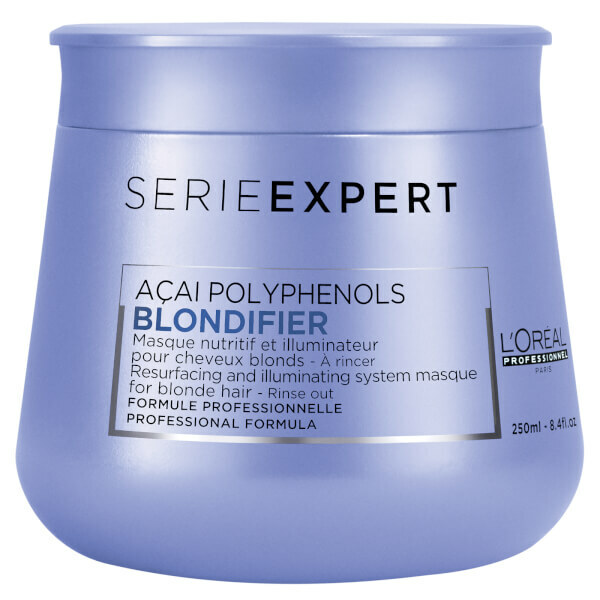 Resurface and illuminate your blonde locks with the L’Oréal Professionnel Serie Expert Blondifier Masque; a nourishing hair mask that replenishes and smooths fibres of each and every strand for revived shine and radiance. Enriched with Polyphenols present in superfood Açai Berry, the antioxidant-packed treatment leaves fair hair soft, smooth and brilliantly lustrous with enhanced resilience and improved health. After shampooing with Blondifier Shampoo apply evenly on towel-dried hair. Leave on 3-5 minutes. Rinse thoroughly. In case of contact with eyes, rinse them immediately. In case of mixing with the Blondifier booster please refer to safety instructions. Aqua / Water, Cetearyl Alcohol, Behentrimonium Chloride, Cetylesters, Cocos Nucifera Oil / Coconut Oil, Isopropyl Alcohol, Benzoic Acid, Pentaerythrityl Tetra-Di-T-Butyl Hydroxyhydrocinnamate, Benzyl Salicylate, Benzyl Alcohol, Linalool, Limonene, Sodium Hydroxide, Hydroxycitronellal, Citronellol, 2-Oleamido-1,3- Octadecanediol, Tocopherol, Alpha-Isomethyl Ionone, Euterpe Oleracea Fruit Extract, Maltodextrin, Parfum / Fragrance. C220483/1.